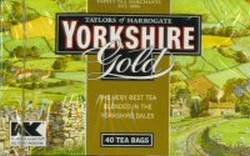 Yorkshire Gold is considered the very best black tea blended in the Yorkshire Dales. A blend of Indian, African and Sri Lankan teas giving it tremendous character and flavor. Ann Marie's husband swears it is the "best" morning cup of tea around.